The Golden Mean has beem used by artists, photographers, architects and musicians through the centuries. Many aspects of nature such as leaves growing up a stem, shells, the human body proportions. The callipers have three prongs and the division is set to the Golden Mean- 0.618 and as you stretch the callipers they expand at the rate of the Golden Mean proportion. If you buy the full set you will have the flexibility of using the large callipers to stretch to a half sheet of watercolour 56cm. The outer prongs can be placed flat on the either edges of the paper. 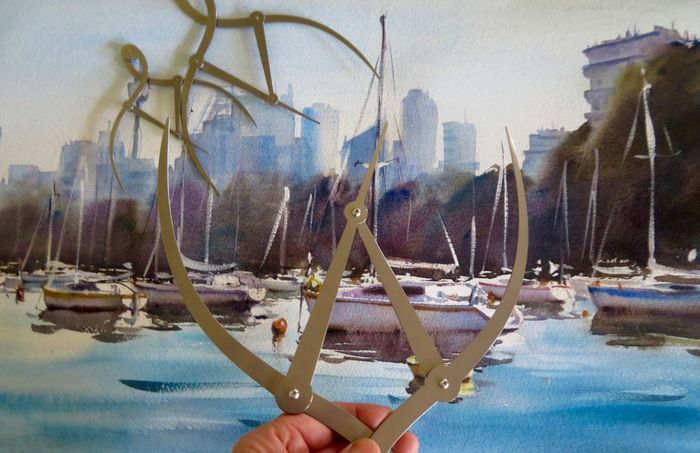 The middle Golden Mean prong will give you the ideal place for a focal point for instance a mast of a yacht or figure, whatever is you main focal point. From there you can place Golden Means within Golden Means, check this on an image of Turner’s famous oil: “Fighting Temeraire” and you will see the black funnel is in the Golden Mean and he has then place the buoys and setting sun etc in the Golden Mean in the gaps between subject matter. The Medium Calipers will stretch to a half sheet and the small reference photographs and finer detail in the painting that the large calipers are too large to work with. I use the calipers on a regular basis to check on focal point placement in my paintings and checking for portrait measurements to enable me to develop a greater competency in judging measurements by eye. Place your order with Jacky who uses and endorses these callipers. Full set of 3 for $180. All come in beautiful hardboard box. NZ made. Calliper photographs, more information and YouTube links can be found via the official website: www.goldenmeancalipers.com.